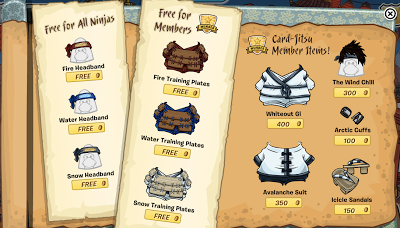 Club Penguin Cheats by Mimo777 Club Penguin Cheats by Mimo777: CARD-JITSU SNOW! 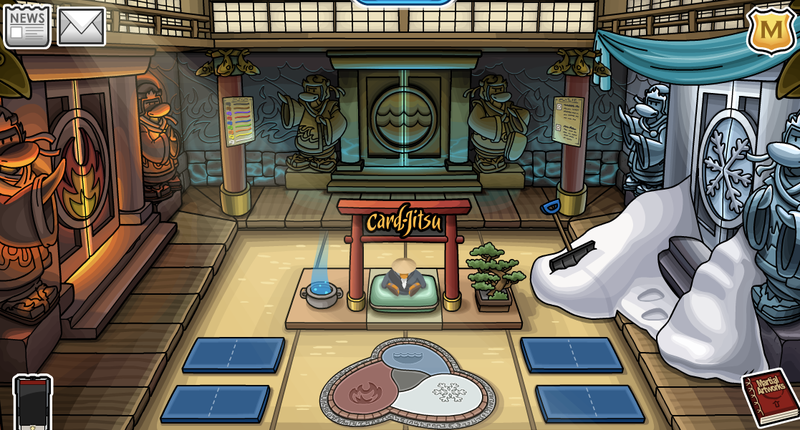 Card-Jitsu now is finally here! The whole island is decorated and so excited for the new Jitsu game! First thing to check out is the FREE items for the party in your botton right corner! And also paid members items. So now... Let's get to the game! 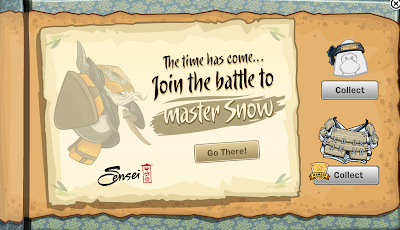 First, this will apear on your screen as soon as you log on so collect your Snow Headband and if you're a member collect your Snow Training Plates! Then click "Go There!" 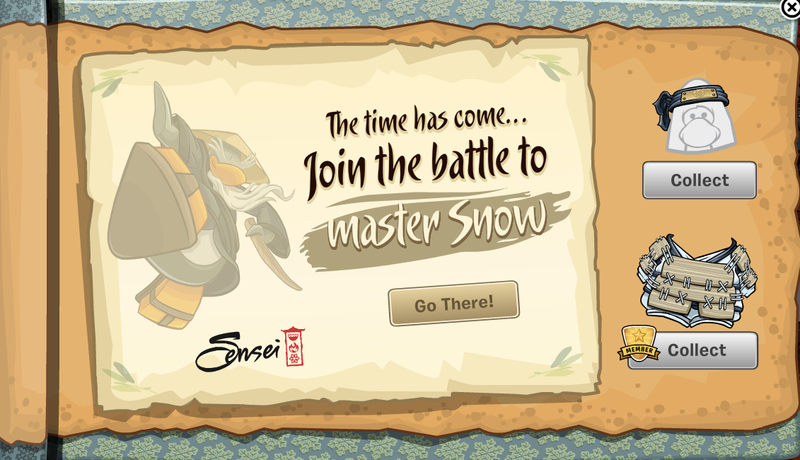 Sensi will take to you and give you your Snow Starter Deck! Now step into the all NEW Dojo! And go through those snowy doors. Now click the bridge that takes you to your battle! If you weren't apart of the beta or you don't know how to play it'll tell ya. Once you finish a round this'll pop up. 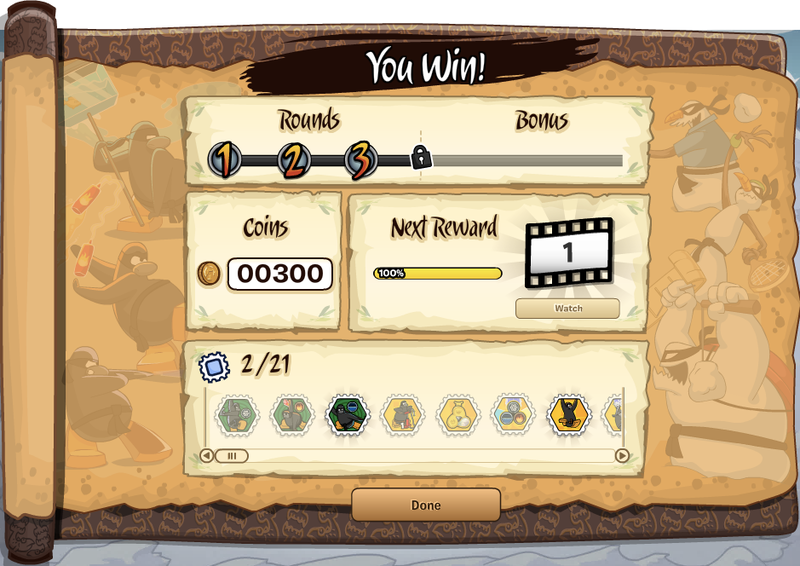 It shows you the coins and stamps you earned, also it has a video on it for you to watch. Also, if you click the cards in the bottom right corner of your screen it'll show you all your progress. It tells you what prizes, videos and gear you've earned and watched. So that's pretty much it! Tell me what you think of it all! 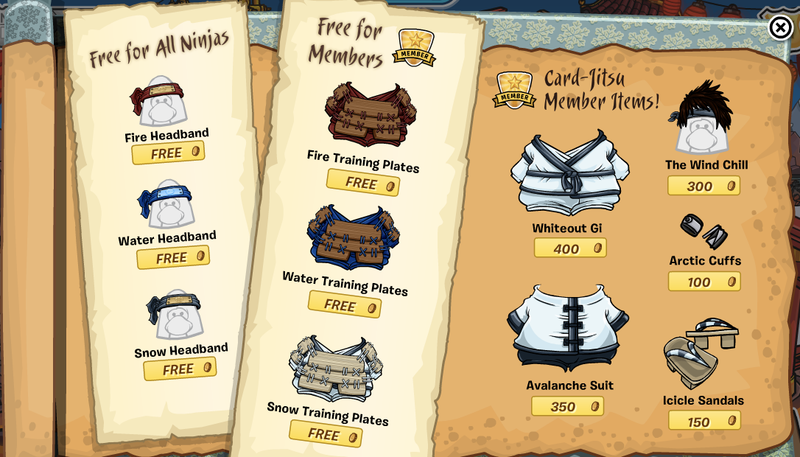 Can non-members get the snow suit too? There is a glitch, when you click on battle against minions the game gets stuck on a white screen. Mimo I have found something! In the one of the logoff card jitsu screens, with all 3 ninjas fighting the snow men with sensei in the background, if you look closely you can see a dark shadowy figure. They need to add chat to card-jitsu snow. OMG, I choose my element, but then it says in an orange box that it had a problem matching me up with players!! Ugh, please Mimo, help!!!!! lol... anyone even remeber me? Does anyone else get lag when playing or is that just me? How do you fix this? It's starting to work better now. Most of the time I get in. It's REALLY annoying though when you have somebody quit in the middle of the game. I GOT IT AND IM NOT A MEMBER! whats all the stuff after the snow gem? how do you get the starter pack for snow, i done everything and it still didn't give me it. -_- when I already have it!! !